"On Wednesday afternoon, 7th July, 1824, about 1 o'clock, a destructive fire broke out among the shavings in a carpenter's yard, in the rear of Beacon, Charles and Chesnut streets, communicated by sparks from a chimney on fire in the tavern-house in Charles Street, occupied by Mr. J.A. Haven; and the weather being dry, and the wind blowing nearly a gale from the westward, all efforts to prevent its spreading, (although when first seen it was not larger than a man's hat), were ineffectual; and it immediately extended to the workshop of Messrs. Stoddard & Lincoln, house wrights, to the contiguous fences and out-buildings, so their brick dwelling houses in Chestnut street, adjoining and to houses on Charles and Beacon streets. 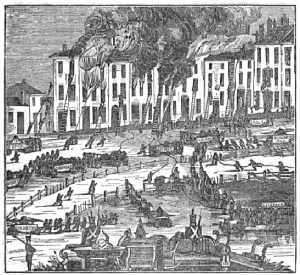 The alarm was given instantly, and the citizens and fireman with their engines assembled with alacrity; but the fury of the winds scattered the flames in many directions so instantaneously, that six or eight dwellings and out-buildings were on fire before the inflammable materials of the shop and lumber piles were half consumed. The two brick buildings owned and occupied by Messrs. Stoddard & Lincoln, and in part tenanted by Mr. Andrew Sanborn, constable, his wife and sister, were so suddenly on fire, that many of the inmates could save but little other than the clothes they had on. The back parts of the brick block on Beacon street, were also so suddenly involved in the calamity, that the furniture, goods, & c., were removed with difficulty and damage, and all hopes of saving the Charles street block of six commodious houses was abandoned; and the great efforts were made to stop its progress up Beacon street, where there were fifteen spacious brick dwellings in continuity. Seven of the houses in Beacon street were so directly in the range of the devouring element, rendered suffocating by the heat of the smoke and dust, as to prevent their near approach on the leeward and front side, that notwithstanding they were all separated by partition walls, some of them new, and others recently erected, all the exertions of the fire wards and firemen to prevent their entire destruction were unavailing; although at the hazard of life, much of their furniture & c., was thrown out and secured. The eighth house from Charles street on Beacon street, was preserved by the most intrepid and persevering exertions, and limits were put to the fire in that direction; but so complete, for nearly three hours, appeared to be the ascendancy of Fire over Water that the spacious mansion houses extending to Spruce street, (eight in number, all having partition walls between them), were completely emptied of their rich furniture, stores of liquors, and even fixtures—which were deposited in huge piles on the Common. The Mayor, Hon. Josiah Quincy with a number of police officers, took active and efficient measures to preserve this property; and at his suggestion, a detachment of forty men from the New England Guards, under Capt. Loring, were promptly marched on the ground, and established a guard for its protection. They were afterwards relieved by the Independent Cadets, at sunset; the latter by the Boston Light Infantry at 11 o'clock; the Infantry by the City Guards at half past 1; at which time the Washington Light Infantry were on the ground; and at 4 o'clock the Sea Fencibles went on duty. The Cadets continued on the ground till 5 o'clock on Thursday morning. The following houses were burnt, in addition to the shops,out buildings and lumber first consumed. On Chestnut street—two new brick houses, owned and occupied by Messrs. Hezekiah Stoddard and Joseph Lincoln, who also owned the carpenters shop and lumber & c., in the yard. On Charles street—A block of six brick houses; one owned by Messrs. Elisha Penniman and Joseph Whitney, and occupied by Messrs. L. and T. Putnam, J. Smith, and by Bailey & Staniford, grocers. One house owned by Mr. T.W. Sumner, occupied by Mr. D.R. Griggs. One house owned by Jona. Davis, Esq., occupied by Messrs. Huse. Two houses owned by Mr. Nathaniel Call, occupied by Mr. Wilson, Mr. Farnum, and Mr. J. Hathaway. One house belonging to Mrs. Lancaster. On Beacon street—seven spacious brick houses. One new and nearly finished, owned by Mr. J. Bryant. One house owned and occupied by Mr. T.H. Swett. One owned and occupied by Mr. H.G. Rice. One owned by John Cotton, Esq., and occupied by Mr. T.H. Carter. One owned by Mr. William Minot. On owned by heirs of Daniel Tuttle. One owned and occupied by Mr. S. Bean. Most of the above dwellings had commodious out-buildings, gardens, & c., which with one or two exceptions, were destroyed. A large number of other houses were much injured. It is but justice to the Firemen and citizens of the neighboring towns, to state that they were early on the spot, and did efficient service, as will be seen in the engraving. An engine from Brighton, arrived in the short time of thirty minutes, coming five miles. The Independence engine, situated near Neponset bridge, also came about the same distance in the same time. The towns of Roxbury, Brookline, Cambridge, Charlestown, Dorchester, & c., were well represented, as the fire was seen at a great distance. A body of marines, from the Charlestown navy yard, were also of special service on the occasion. The flames were attacked from every assailable quarter with untiring constancy, but many of the most daring efforts were rendered ineffectual by the tornado, which seemed to have formed an alliance with the flames, and to increase in efforts as the destruction extended. The wonder is therefore that the flames were so much circumscribed. In almost any other part of the city, the desolation must have been more extensive. The flying flakes were carried to along distance across the Common, and fire was set by them to several roofs nearly a third of a mile from the fire; but being well watched by the females at home, were promptly extinguished. The fire was in part checked by the high wall of Mr. Eckley's house. When it was thought it would extend to Spruce street, arrangements were promptly made for bricking up the windows of Mr. Parker's house on the upper side of the street, which, with the aid of wet blankets, carpets and sails, it was hoped would provide a sufficient barrier; but so high was the wind, that the woolen cloths could with difficulty be kept in their places, and several of the old sails were torn from the ropes. The necessity of powerful engines and long hose was seriously felt, as the water had to be brought from the Western Avenue basin or the Frog Pond. There were but two suction engines, we believe, belonging to the Department at the time, consequently there was hard service to be done in the way of passing water in buckets to the engines. This was in fire well calculated to best the powers of the Firemen, and their heroic exertions along prevented its spreading to the State House, No lives were lost, but several Firemen were considerably burned while battling with the flames."